Might as well ask the police and military to suspend carrying weapons. Remember: There are TWO U.S. of A’s when it comes to justice! FB and Twit suspending President Caligula…LOL Wouldn’t THAT be a hoot! THAT would make him REEEEALY melt down. No twitter fix! “Thing”, in this case, meaning “campaign strategy”. These predatory profiteering corporations will only block Trump if their profiteering is derailed. P.S. : webwalk - didn’t read yours first. As usual money and position count more than common sense and compassion. The French developed a LOP-sided way a long time ago. Too Sick that this is the first President who uses a Social Media Company for his Rants and communication with the public, and no one says Boo. His TWIT account should have been shut down the first time he used it. Twitter has been giving him a Platform from the beginning and Now were complaining about it? C’mon!!! The White, racist, presstitute, secretary Sarah Huckabee thinks hate and endangering this courageous, ladies life is: " A GOOD THING"! SARAH SANDERS SAID: IT IS A GOOD THING THAT THE PRESIDENT IS CALLING PROGRESSIVES OUT. I’m sorry, but I require more edge in the insurrectionist posts I read. Please don’t make me or anyone yawn-- this is not the time for that. The reality is this. Due in part to the entire Russia gate thing , Trump is even more willing and ABLE to resort to such tactics as every call to “supsend his twitter” account and the like becomes another example to those Trump supporters that “The Liberals are out to get him”. Added to this just as in Nazi Germany where Hitler villified the Jews so as to give the masses a scapegoat for their economic plight, Trump does the same with Muslims. Those people working 16 hours a day just to make ends meet and barely able to afford shelter are all too willing to accept the notion their plight caused by Muslims or Latino’s. After all these years they still do not recognize their plight comes at the hand of the very people they idolize, that being the FILTHY rich. Why, Shantiananda, how can that POSSIBLY BE?! She a christian from a christian family in a christian country! Oops! I guess I answered my own snarky question. After all these years they still do not recognize their plight comes at the hand of the very people they idolize, that being the FILTHY rich. Yep. And their walls are built around their psyches so strong that getting through is nearly impossible. I HAVE tried! Clyde. yes you did! Sinclair Lewis was indeed prescient, when some 80 years ago in his book: It Can’t Happen Here he said: “WHEN FASCISM COMES TO AMERICA, IT WILL BE WRAPPED IN THE FLAG AND BE CARRYING THE CROSS.” If he were alive today, he could write a sequel: IT HAS HAPPENED HERE ! Just like I said it would! What happened to free speech? Let him sink himself. 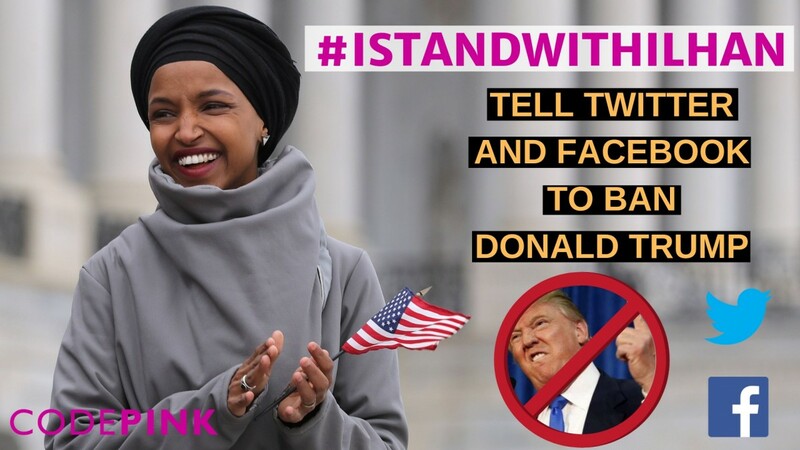 Ilhan is a brave woman who knew what she was getting into. She raised contentious, important issues that have garnered her support and hate. It happens to leaders on either side. This is one obstacle that only direct democracy, people power, can overcome. I see the defenders of freedom and Julian were working on it overnight in Europe…social media went dark. Ecuador’s government sites also seem to gave functionality problems. Just a warning shot. Not like Venezuela were people died when the US spook state turned off electricity to life support systems. His hate speech is legendary, throughout his campaign and his dazes in office it has been nothing but hate. Hate is fear, he and his ilk are afraid of “the other” which is all of us because all of our shadows are the same. Facebook, Twitter, and other social media need to stop aiding terrorists immediately…starting with the terrorist who poses the greatest threat to our way of life…DJT.